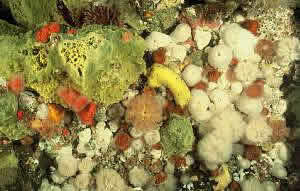 Sponges, sea anemones, hydriods, soft corals, polychaetes, molluscs, barnacles � invertebrate marine life is more diverse when the water flows faster. PROVIDENCE, Rhode Island -- One of biggest factors promoting the diversity of coastal ocean life is how fast the water flows, according to new research by ecologists at Brown University. Experiments and observation in Palau, Alaska, and Maine showed that the faster the flow, the greater the number of invertebrate species that live on rocks under the water. The findings, published the week of Nov. 15 in the journal Ecology Letters, could help improve management of delicate and complex coastal ecosystems, said James Palardy, a former Brown doctoral student and the paper's lead author. Finding the fastest water could point scientists to areas where diversity is likely greatest � and perhaps especially worthy of protection � and to zones where invasive species could establish their first beachheads. Jon Witman, professor of ecology and environmental biology and Palardy's co-author on the paper, said the results were clear and consistent at all three regions, including in Maine and Alaska where they experimentally manipulated water flow speed. "It totally blew us a way that we got almost identical results in two marine regions of the world separated by 4,000 miles with completely different regional diversities, and no species shared in common," Witman said. "It's a wake-up call saying that water flow is a really strong predictor of how many species are present in a particular area of the ocean." The reason why faster flow seems to promote diversity, Witman said, is that it allows for the larvae of rock-dwelling invertebrates, such as barnacles, sea squirts, corals and sponges, to spread farther. Although the environments are quite different, it's somewhat analogous to how trees and flowers can disperse their seeds farther in a stiff wind. Palardy and Witman are not the first to observe a connection between water flow and diversity, but they are the first researchers to prove it with experiments. The research began five years ago when the pair started brainstorming about how they might make the important scientific transition from being able to notice the phenomenon to being able to produce and test it. The pair's goal was to speed up water flow without resorting to expensive and short-lived battery-powered pumps. Instead, the ecologists relied on simple physics that require a volume of water to flow faster when it moves through a narrowed space. Based on prototypes developed in a giant flume in the basement of the BioMed research building at Brown, they built channels about 7 feet long and about 18 inches high. They lined the walls with plates where organisms could latch on and grow. The test channels narrowed to about half their width in the middle, taking on a bow tie shape. The control channels remained the same width throughout. The control and test channels were placed about 3 to 6 feet below the lowest tide in each of two sites in Maine and Alaskan coastal waters. In every case they found that the number of different species on the plates in the test channels was much higher than on the plates in the control channels. The greater diversity was no flash in the pan, either. The pattern was visible from early stages and persisted for more than a year of study. Witman also surveyed natural areas in Palau, and Palardy and Witman did the same in Alaska, finding similar effects in areas with faster flow. Witman said his hope is that the work will not just explain greater biodiversity but will help stem the tide of its loss. "There's a global biodiversity crisis where we're losing species," he said. "Ecology is very much concerned with sustaining natural processes."